Voith couplings ... speed under control. Voith Turbo says its hydrodynamic variable speed fluid couplings provide a cost-efficient solution that boosts the lifespan of combined cycle power plants (CCPPs), as they have been optimised specifically for these plants. The trend toward gas and steam CCPPs in power generation is undeniable, says the Germany-based company. In recent years, their numbers have increased dramatically with a total of 138 new plants having been planned between 2013 and 2015 alone. He says a large number of modern CCPP operators trust in hydrodynamic variable speed fluid couplings from Voith to control the speed of their boiler feed pumps. To further reduce costs for operators, Voith continues to develop the product line and has optimised it specifically for the requirements of CCPPs. 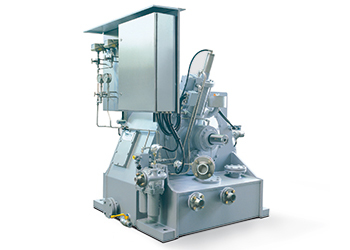 “Proven over more than 70 years, installed in more than 1,100 systems and plants globally, and conceived for operating conditions ranging from -40 deg C to +55 deg C, variable speed fluid couplings control the speed of boiler feed pumps for changing operating conditions,” says the spokesman. He adds they ensure soft acceleration of the driven machine and load-free motor start-up, preserving the driveline. Hydrodynamics also offer another decisive advantage: The coupling supplies both the motor and the boiler feed pump with lube oil at all times. This means it is not necessary to install an additional lube oil system, thus saving space and money for the operator, says the spokesman. Voith variable speed fluid couplings for this field of application transfer power of up to 5 MW and, with a mean-time-between-failures (MTBF) exceeding 25 years, ensure maximum safety and reliability in use, he says. Their robust design also makes them suitable for external use in plants built in the open. Citing International Energy Agency (IEA) estimates, he says, by the year 2040, gas will have established itself as the most important component in the US energy mix with annual demand of 900 billion cu m.